Andrew Peng, 20, looked like any other Asian American student. Only deep in his heart, he knew he was a chicken. Especially with his special virtual reality goggles on. 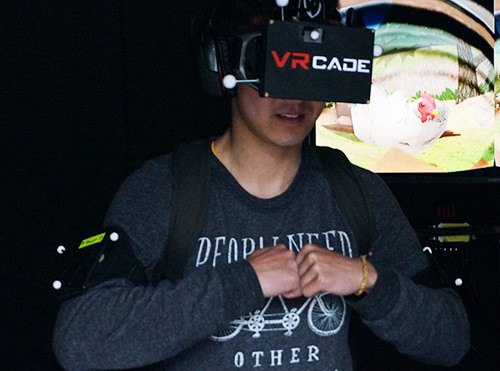 At UC Berkeley, one of the most Asian American campuses in the nation, students were lined up for a unique demonstration–to experience the first virtual reality study to go cross-species. Most scientific applications to date have involved humans, especially in empathy studies. But this one set up by PETA (People for the Ethical Treatment of Animals) attempts to see whether a sense of empathy can be developed between you and the animals sent off to be slaughtered and eaten. Would you, could you, order that General Tso’s Chicken if you clucked a mile in the chicken’s shoes? Would you exhibit noticeable dietary changes after two minutes wearing some high-tech virtual reality goggles that are, incidentally, cooler than the Oculus Rift virtual reality gamer goggles that Mark Zuckerberg just bought for $2 billion in June? The Oculus goggles are tethered, connected to a computer. PETA’s are wireless to give you that free-range experience. And though you’re in an animated world, similar to one created by PETA’s benefactor on the project, The Simpsons‘ co-creator Sam Simon, this is no video game. I saw Peng put on the glasses and flap his wings. The experience ends when you, as a chicken, ride with others in a truck to a slaughterhouse. Peng said he’d definitely think about things before he eats another chicken wing. Another student, Rachel Kang, 21, had been vegetarian, even a vegan. 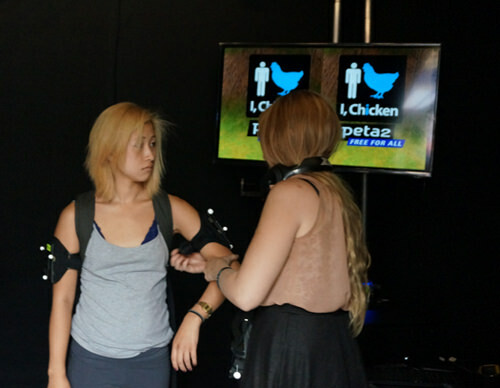 She started eating meat again but said the PETA virtual reality experience made her more aware of what’s at stake when she eats chicken. And much more empathetic. When I put on the glasses, I didn’t know what to suspect. I kept falling into a little pond and could never get close to the other chickens I saw. But then we were put in the truck to be taken to slaughter. It does make you think of the nine billion chickens killed in the U.S. every year. That’s right, nine billion a year, about 26 million chickens a day. Full disclosure, my wife works for PETA, but not on this project. We eat a lot of tofu. All the tofu I eat pretty much assures I don’t need virtual reality to address the ethics of my diet. But as I stood in line to try on the goggles, I wondered whether the same virtual reality techniques could be applied to help people develop empathy toward persons of a different race. Andrew Peng, one of the students I talked to, told me he came to the U.S. from Beijing 14 years ago and still gets racist reactions, even in Berkeley. Especially when people hear his accent. What if, by virtue of the goggles, a little empathy could be developed for Andrew the Asian American? Or to use a more recent example in the news, what if the goggles could give you the experience of a black man in a place like Ferguson, Missouri, walking to the police with your hands up? Would that change your perspective on race and humanity? Imagine what we would feel and what we would do if white drivers were three times as likely as black drivers to be searched by police during a traffic stop as black drivers instead of the other way around. If white offenders received prison sentences ten percent longer than black offenders for the same crimes. If a third of all white men–just look at this room and take one-third–went to prison during their lifetime. Imagine that. That is the reality in the lives of so many of our fellow Americans in so many of the communities in which they live. Fighting for people of color will take more than fighting ignorance with more information. For empathy’s sake, it may be more a matter of imagination–or the lack of it. To solve that problem, virtual reality goggles could help. But they shouldn’t be necessary in a truly compassionate society.